It's Time to RewindThe Bonus Scene : This was included after the end of the book - one short scene from Kale's PoV. Apparently, the best was saved for last because this was my favorite part of the book, apart from the wild beginning. I can honestly say that this is the first time I truly got to vibe on Kale and how his mind worked. Watching this one particular scene was priceless. I loved it.The end of the book : Cliffhanger? Kinda, sorta. Not anything worth freaking out about. I've been to cliffhanger hell before. This was not it. There's something about where the cutoff point happened which honestly struck me as odd.The last 25% of the book : I'm scowling (yes, I'm bringing back the word scowl. Who uses this anymore?) at the book because one person's actions made me GRRR. Yes. I GRRR'ed and scowled. Although, I can honestly say that I must have been falling asleep as the breadcrumbs were being dropped because I didn't see that trail. Of course, it might have been because we'd hit another lull again.The middle section of the book : This is where I felt like the story started to get its groove back. The first 25% of the book : Let's just say that I got stuck here for over a week. What was up with that several chapter lull? I almost quit reading.The beginning : HOLY HOT MESS!!! Awesome start to this book! Wow, I'm so excited to keep reading! Everyone and everything has GONE MAD!! 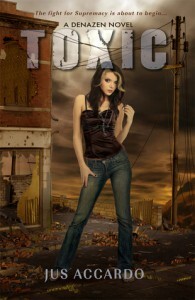 !Why I chose to do this review in reverse - Well, let's just say that Toxic was sort of like a rolling wave. We started high, then it crashed, then the wave built back up, etc. The story was book-ended at both directions in much the same way, that I felt like the ending was just another beginning. I kept this review vague because there would be too much to spoil with a few of the things which happened. This series is one part romance and one part tale of kids with superpowers. If you like that kind of stuff then maybe you'll like this book. Or maybe not. How's that for vague?Does Toxic qualify as a "second bridge-book slump?" Possibly. I wasn't unhappy with the story but found myself not as excited to rush through this book as I was the first. There were a few great scenes and I found enough to enjoy that I'll be picking up a copy of book 3...but I can only hope we'll get to see more action um, world building, um backstabbing, um, STUFF (term to be identified later) in the future.Btw...I take back what I said about not needing to read the short story in between books 1 and 2. I highly recommend reading Untouched because book 2 does sort of pick up with the assumption that you've read the short story. Random Note : Dez's powers are now pretty cool. She's no Georgina Kincaid, but I like how she has a similar thing going on.